Say so long to lavender (for now, at least). In 1982, the Japanese Ministry of Agriculture, Forestry, and Fisheries coined a new phrase that defined a specific practice of nature therapy: shinrin-yoku, or “forest bathing.” The practice is exactly what it sounds like—spending time in nature without necessarily exerting yourself with a hike or more intense physical activity—and studies funded by Japanese officials have shown its benefit on both mental and physical health. It should come as no surprise, then, that one of the most prized forest-dwellers native to Japan has grown in popularity outside of the island nation for its stress-relieving properties. The hinoki—or Japanese cypress—is an aromatic, anxiety-relieving treat. Hinoki has long been cherished in Japan for its subtle lemony scent, aversion to rot, and sturdy, long-lasting timber. It also has spiritual and cultural value, as its wood is used in the construction of both Buddhist and Shinto shrines across the country, including Ise Jingu, a shine that is ritually torn down and rebuilt every 20 years—a tradition that has been carried out for over a millennium. More recently, though, scientists have shown that this specific tree has a number of psychological benefits. In one study, olfactory exposure to hinoki resulted in a calming effect in participants, and another more recent study even showed that simply touching hinoki wood could elicit a relaxing physiological response. This is a particularly giving tree. All things considered, this natural mood-booster is a fresh way to chill out, whether you enjoy its bright, woodsy scent, or incorporate its natural-toned lumber into your design scheme. These 11 picks will help you bring the outdoors in—just make sure that you also make some time for shinrin-yoku, too. This simple, alcohol-free room spray is gentle enough to spritz on your bedding, clothes, and assorted linens, making it a great pick-me-up in the middle of a groggy day, or a gentle wind-down just before you slip under your covers. 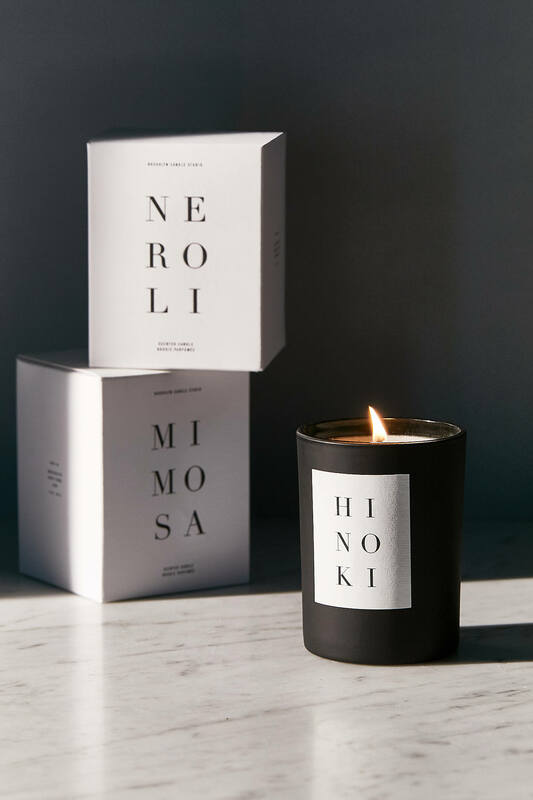 With a burn time of up to 70 hours, this hand-poured candle pairs a clean hinoki scent with woodsy compliments like cedar leaf, and spicy accents like cardamom. Its simple label makes it a perfectly chic addition to a bedside table. If you’ve truly fallen head-over-heels for this soothing scent, Le Labo offers an entire hinoki-themed shower collection. Our singular pick for a luxe bathing experience is the shower gel, which is formulated with skin-softening sesame oil. Inspired by the warm mists above Japanese onsen, or hot springs, this body essence is rich in skin-protecting antioxidants in ingredients like sencha green tea, wakame sea kelp, and gobo root. Use it on your body like you would use toner on your face, as an extra layer of hydration. Naturally antibacterial, this simple soap dish will last for years. Since hinoki wood isn’t prone to rot, it’s a prime material for bathroom accessories. This all-natural essential oil can grant a room the serenity of the forest when it’s used in an aroma diffuser, but it also provides major relaxation benefits when just a few drops are added to a bath. As with any essential oil, take care not to apply it directly to your skin without mixing with a carrier oil first. If you’re looking for a more potent room fragrance, incense is the way to go. These hinoki-scented incense sticks are actually made from the wood itself for an authentic experience. The 2018 study surrounding hikoni’s effect when physically touched specifically looked at the benefit granted when participants placed their feet on the material—so a hinoki bath mat is an easy way to bring an additional wellness boost to your bathroom. Add a few drops of an essential oil to this hinoki wood diffuser, and it will absorb into the wood, then naturally give off that specific scent. It makes a more organic-looking alternative to electronic diffusers, and when paired with hinoki essential oil, it gives off a deeply calming aroma. This scented greeting card makes a delightful surprise for a friend in need of a pick-me-up, but it can also refresh your clothes when tucked into a drawer. Snag one to send in the mail and another for yourself to get the good vibes really flowing. This delightful, oversized tea bag contains both hinoki wood chips and essential oil to give your bathwater a full aromatic makeover. Just allow it to fully dry out between uses, and it can be multiple times, as the wood is naturally microbial.